Wikipedia says that “The arepa is a corn-based bread from the northern Andes in South America …” In reality, pregnancy an arepa is more similar to a savory corn pancake, ask and depending on who’s making it, more about it’s sometimes filled with gooey cheese. Down here, every street festival has an arepa cart which sells very greasy, very cheesy Colombian-style arepas. There’s even a semi-permanent arepa stand at Hobie Beach on Virginia Key that I’m sure gets lots of business from the multitude of hungry cyclists, runners and beach-goers that crowd the area during the summer. Anyway, there are infinite recipes out there, all using different amounts of butter, cheese, milk and oil. I opted for a lighter version of the original, omitting the butter and cheese and keeping it as simple as possible to let the corn-ness (is that a word?) really shine. The result was just as flavorful, but way less greasy than the arepa cart. Since I was trying to keep this meal light — it was lunchtime after all — I served my warm arepas with a refreshing crab and avocado salad. I loved the crab salad as an alternative to tuna and egg salads for the summer months. It would make a perfect lunch with some whole grain toast and leafy greens. 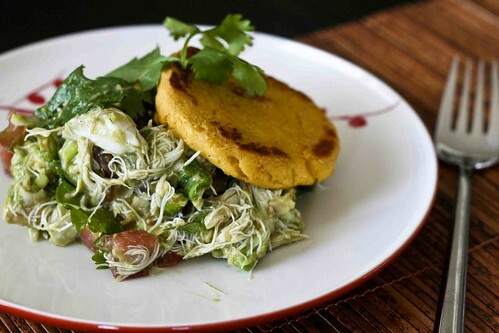 It also elevates the arepas from small and snack-like to a full-blown meal, perfect for hot and humid evenings. If you can’t find arepa flour, also known as masarepa, you can substitute Masa Harina. You can also add about 1/2 cup of shredded cheddar or mozzerlla cheese to the dough for a more snack-like bite. Preheat oven to 350°. Warm the milk on the stove or in the microwave until it’s almost simmering, then mix it with the arepa flour with the salt. Cover the bowl (I topped it with a plate) and set aside for 5 minutes. Now, you’ll want to use plastic wrap to help you form the arepas since the dough is kind of sticky and unmanageable. Place a large piece of plastic wrap on your work surface and scrape the dough onto it. Cover with another piece of plastic wrap and use your hands to flatten the dough out into a 1/2-inch thick disk. Cut the dough into 8 equal portions use another sheet of plastic wrap to form them into 1/2-inch thick, rounded arepas. They don’t have to be perfect. In fact, the craggly edges are pretty tasty. Heat a large skillet over medium and add the cooking spray or butter. Working in batches, brown the arepas on each side, until they brown and form a slight crust, about 3 minutes on each side. Transfer them to a parchment-lined cookie sheet and bake for 20 minutes. Toss all of the ingredients together and let marinate for 20 minutes. Serve in corn tortillas, on toast or on top of warm arepas. Yum–You’re using 2 of my absolute favorites: crab and avocado. I’ve never cooked with masa or arepa, but I’m sure it’s available in my area. Sounds delish! Wow, this looks outstanding. Am not familiar with arepa, but love masa. Yum! sounds wonderful, i’m gonna try it the next time i have avocado. need to get the other ingredients though. like your photo, too! These look delicious! I just watched a Bobby Flay Throwdown the other day that featured these. The women who owned the restaurant were from Venezuela, I believe. They seem similar to Mexican sopes. How are they different? What a beautiful arepa! And the salad looks so cool and refreshing. I gotta admit the lighter version of your arepas sounds a whole lot better than the ones sold in carts. I’d love to try it one time with crab and avocado salad.